My bursary project involved research into a portrait named The Woodman by Francis Henry Newbery (1855-1946) which was acquired in 2010 by Bridport Museum in Dorset. Newbery was celebrated as the director of the Glasgow School of Art from 1885 to 1917, where he was responsible for nurturing the talents of Charles Rennie Mackintosh. After his retirement he was known for his inclination towards portraying ordinary country residents and The Woodman is no different. 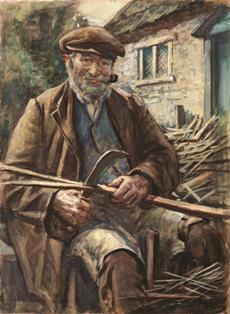 It depicts an old man who is in the process of making spar gads (sharpened points of wood used for thatching). The main aims of my research were to determine key facts about the painting, including the date it was produced, the identity of the sitter, his age, location and craft. I collected all of my information into a concise report, along with some books which were accessioned to the museum. They will now be used to increase the museum’s reference material on Newbery, which is accessible to the public for research purposes. The findings of my research have also been presented with the painting in a new exhibition entitled ‘Bridport Faces’ which opened in April 2011. The bursary has assisted my professional development and I now know that the Understanding British Portraits’ research facilities on their website will be a first port of call for future reference. I would encourage people to apply next year as I feel I have expanded my research skills, experienced the important role of interpretation within the sector and assisted my local museum in increasing its knowledge base.